A team of virtual reality enthusiasts working in Israel has built a simulator that recreates the experience of flying in the Iron Man suit. Via the Google Earth Blog, the system is built around the Google Earth Flight Simulator, which lets you fly around Google's 3D representation of the world. This program is fed into a set of virtual reality goggles, controlled by a motion-sensitive Nintendo WiiMote attached to the wing off of an unmanned aerial vehicle -- that is, a drone. 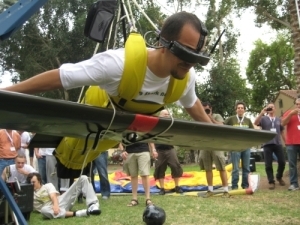 The user is strapped to the wing and a propeller, and the whole rig is suspended in the air by a small crane. It's very weird, way too elaborate, and incredibly awesome.